Facebook has been around for over a decade, and it's not going away anytime soon. This social media platform is entertaining, educational, and fun! Not to mention it serves as a great reminder for birthdays. At VisionAmp Marketing, we love to use Facebook to assist in your marketing efforts as well. It's an easy and affordable way to gain customers, brand recognition and get the word out about your services, products, and any specials or deals! We can help you gain more likes and followers, and teach you the ins and outs of Facebook. Let's start with the basics - making a Facebook post. Some people, who have not navigated Facebook before, need to start from the beginning. In order to post to Facebook, there are a few steps to follow. At the top of your News Feed, you will see a white rectangular box that says “What's on your mind?” Here, you can update your status, add photos/video, and create a photo album! Once you update a post, it will be added to your Timeline for the public to see. So, how do you post a status update? Type your update at the top of your News Feed on the homepage or click over to your profile and type in your update at the top of your Timeline. There are a few fun options you have control of in your status update, such as tagging friends (plus sign icon at the bottom of the box - this means the post will show up on their Timeline as well), tag a location (arrow icon at the bottom of the box) or select your mood (share with your friends and family how you are feeling, or what you are up to). You can also add a photo or photos to your post by clicking the small camera icon at the bottom. Another thing we suggest when using Facebook posting for marketing your product or service, is to always link the post back to your website. Open up your website in another window and go to the page that you'd like to highlight in your post (ie: if you're a resort and you are wanting to push a Spring Special on Boat Rentals, find your Boat Rentals rates page and copy that url). Go back to Facebook and make a post talking about your Spring Boat Specials. Give people the basic information and make it sound appealing. At the end of the post, say something like "Book Your Boat Rental at A+ Resort today and find out more information about A+ Resort at our website, (paste in the url). This gives people a clear call to action to go and DO something after reading the post. Now that you have gotten used to posting to Facebook, it's time to learn how to BOOST your posts. Boosting posts is a smart and inexpensive way to gain more exposure for your posts. Facebook makes it pretty simple and gives clear step-by-step instructions. 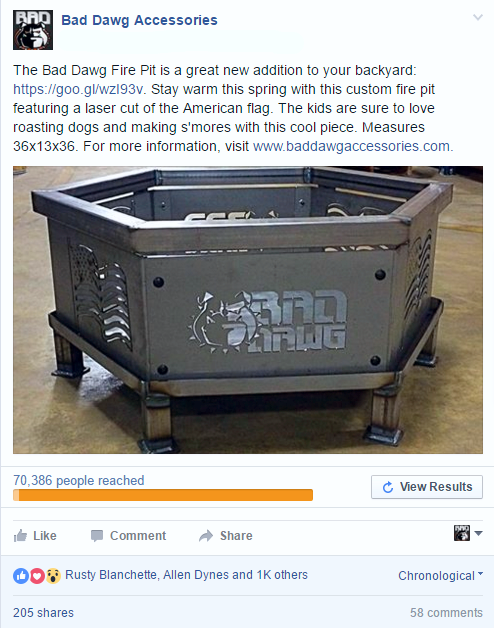 Posts are boosted directly from your Facebook page. From $5 to $550, you can boost your post for any amount that you desire. This is a great way to expose more people than just your friends to posts, promote upcoming events, special offers available online and in-store, and more! To get started, first click on the post that you want to boost. This can either be a brand new post or a currently existing post on your Timeline. Click on the blue button that says “Boost Post” in the bottom right-hand corner of this specific post. The ad will then be automatically created from your post. Next, you will want to choose the audience that you want to target. This allows you to decide who you would like to see your post. If you select “People that you choose through targeting,” then you will be able to specify the people who see your boosted post. You have the ability to edit locations, ages, genders, as well as interests. If you decide to select “People who like your Page and their friends,” then your boosted post will only be visible to those people. In order to have this option, at least 50 people must like your page. You can choose interests specific to your post (ie: if you are posting about a flower sale at a nursery, interests you choose might be gardening, lawn and garden). The more interests you choose, and the more detailed you target the post, the more expensive the boost will be. Finally, you will want to set your budget. Decide how much you want to spend on your boosted post, it may be as little or as much as you want. Facebook provides you with an estimated number of people you will reach, depending on the amount of money that you set as your budget. Then, choose how long you want your post to be boosted for. This defines the duration of how long your boosted post lasts. Run it for one day, one week, or two weeks. Click “Boost,” and voila! You've just boosted your very own Facebook post. Watch the results unfold, and make sure to be available to answer questions and comments about your post.